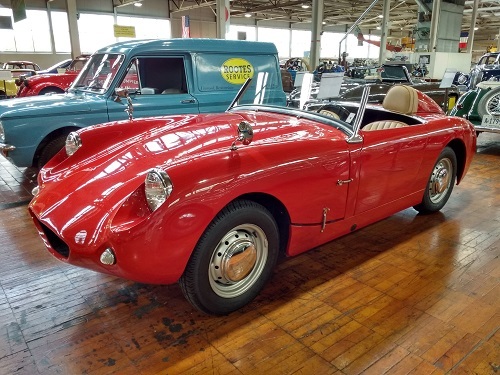 Known affectionately as the “Bugeye” in the US and “Frog-Eye” in the UK, the Mark I Austin-Healey Sprite was an entry level British sports car introduced in 1958. 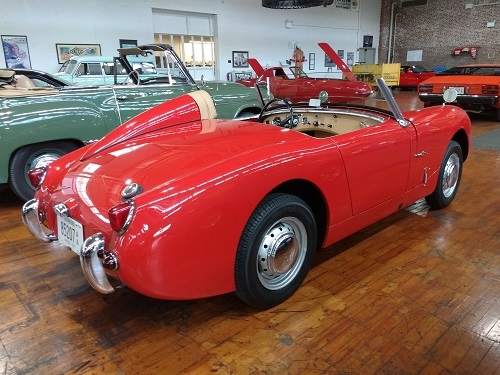 Designers Donald Healey and Leonard Lord saw a chance to fill a gap in the market below the larger and more expensive MGA. Instead of a traditional body-on-frame construction, the Sprite would become the world’s first high-volume unibody sports car. It was marketed as a car small and inexpensive enough that “a chap could keep it in his bike shed.” To keep production costs down, parts were utilized from other British Motor Corporation cars, including the engine and front suspension from the Austin A35 and the rack-and-pinion steering from the Morris Minor. BMC’s Competition Department entered the Sprite into competition starting in 1958. It won its class at the 1958 Alpine Rally. 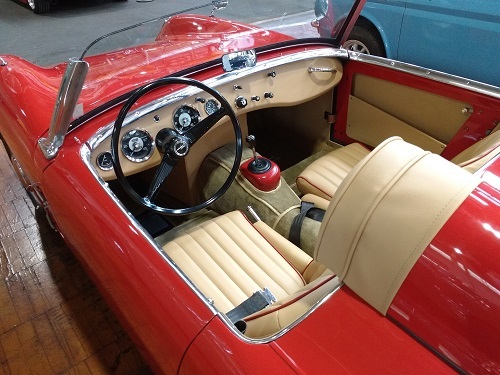 In 1959, the Sprite achieved a 1-2-3 finish in its class at Sebring, followed by a 6th place finish in its class at the Targa Florio later that year. In 1960 and ‘61, Sprites won class victories in many events including Sebring and Le Mans, piloted by well-known drivers such as Walt Hansgen, Bruce McLaren, and Pat and Stirling Moss. Mark I Sprites are still often seen in amateur competition today, sixty years after its introduction. 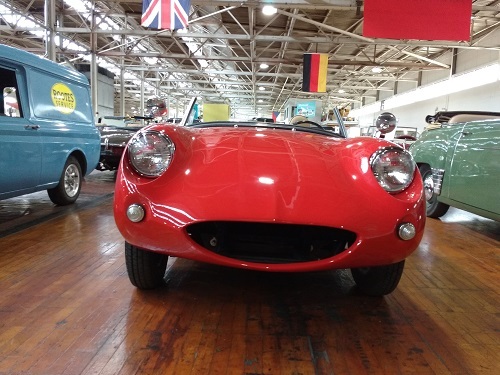 The Mark I Sprite seen here has a racing-style headrest behind the driver’s seat, and an unknown aftermarket nose attached to the front of the vehicle, losing its familiar upright headlights and grille. The sloping front end provided better downforce on the racetrack. Many companies offered similar aerodynamic aides. Manufacturer: Donald Healey Motor Co. Ltd.